The nation's roads are fast becoming a 'National disgrace' after decades of under investment and poor maintenance by government and councils. With year on year decay in the condition of OUR ROADS along with the increasing bad weather, the UK road network is getting to the tipping point of no return. The planned funding by government and councils over the next few years is less than 50 percent of what is needed to stop the rot. However even if the funding figure was doubled it would not tackle the massive backlog in road maintenance the nation currently has, of around £11 billion. Something needs to change NOW! NO MORE bickering between government and councils over funding. The truth is what we all know, OUR ROADS are falling to bits and it cannot go on anymore. We are fed up with all the spin by both of them and just want something done about the state of the roads. Motorists pay over £50 billion a year into government yet well under 9% of that is spent on road maintenance. The roads are a key asset so why is it not maintained as such? 1. Ring fenced funding for Road Maintenance from government. 2. Double the funding levels to Highways Authorities to stop the rot. 3. Ten year plan with investment to clear the backlog of maintenance works & monitored by DfT or a new Road Regulator for the road user/taxpayer. 4. Improved management of works and contracts. 5. Improved quality control of works. 6. Change from Road Fund Licence back to Road Tax which is solely for maintenance of OUR ROADS. (reduce fuel duty to allow for increase in Road Tax). 7. Increase the guarantee period for reinstatement of utilities works in the highway from 2 to 5 years. 8. Utilities to pay an opening charge for works in the highway to authorities to provide fund for future repair works as a result of their excavations. 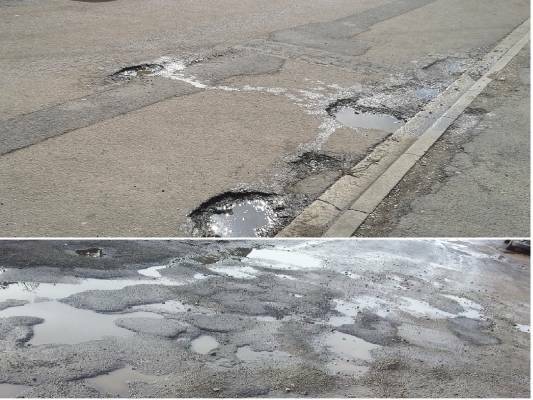 All of the potholes not repaired last year are now getting worse, with the volume of rain and now freezing temperatures over the coming weeks the roads will break up more and more. Please report them via http://streetrepairs.co.uk/ with pictures if safe to do so. * For more information regarding media usage, ownership and rights please contact Mr-Pothole.